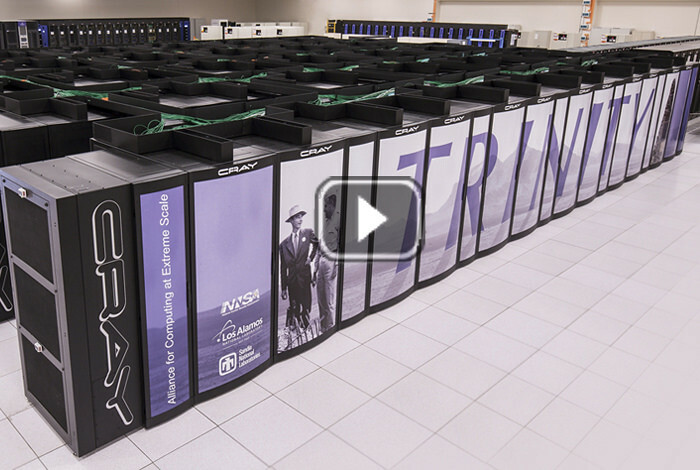 The Trinity Supercomputer Phase II project was completed during the summer of 2017. Now one of the fastest supercomputers in the United States, the Trinity Supercomputer Phase II project was completed during the summer of 2017, and the computer became fully operational during an unclassified “open science” run. The computer has now transitioned to classified mode. The Trinity supercomputer is designed to provide increased computational capability for the NNSA Nuclear Security Enterprise in support of increasing geometric and physics fidelities in nuclear weapons simulation codes, while maintaining expectations for total time to solution. The capabilities of Trinity are required for supporting the NNSA Stockpile Stewardship program’s certification and assessments to ensure that the nation’s nuclear stockpile is safe, secure and effective. With an expected operational lifetime through 2020, Trinity is an approximately 41.5 petaflop (41.5 million billion calculations per second, peak performance) supercomputer based on the Cray XC40 architecture. It consists of 19,420 compute nodes utilizing two processor architectures, Intel Xeon Haswell and Intel Xeon Phi Knights Landing. It is a water-cooled system with a power requirement of about 10 megawatts. For more about open science on Trinity, see Computer learns how to imagine the future. October, 23 2018 - Recent work at Los Alamos sheds light on the mechanisms that lead to broader immune responses in HIV infected individuals and will help inform future vaccine designs. October, 11 2018 - Researchers developed a unique approach that decouples two competing physical mechanisms that have prevented scientists from improving cold cathode efficiency. October, 5 2018 - These higher, more exclusive orbits may soon be accessible to small satellite vendors thanks to a novel technology, the Radiation Hardened Single-Board Computer.